Rejoice, 4k gaming monitor fans. The end of 2018 finishing with full of innovation and cutting edge technologies. Especially, 4k monitors are significantly kicking the limitations to the cliff. Yeah, “this is Sparta” claimed prominent monitor manufacturers such as Asus, Acer, LG, HP and Samsung. Time to prepare for 2019 and onwards for your gaming hardware setup. Luckily, most monitors did their important parts by providing latest breakthrough in refresh rate department. At last, 4k 144hz is possible now with less latency and zero bottlenecks to you Graphic Cards. If you are now looking for the best 4k gaming monitor 2019, this review post is just right to pick the most suitable for gaming. Recently, new brands launched like Predator, ROG (Republic of Gamers) and Omen under famous companies. The purpose of these brands is ensuring the clear line between Gaming and Standard monitors. A notable Gaming brands are specially designed to meet gamer’s choice. Once you buy 4k (2160p) with high refresh rate monitor you can save significant budget in a 5-7 years timespan. No need to worry for monitor upgrades like other people upgrading every 2 years with FHD to QHD (1080p) resolution. Without further ado let’s begin to choose your best 4k monitor. Screen: 27 inch | Aspect ratio: 16:9 | Resolution: 3840 x 2160 pixels| Panel Type: IPS | Refresh Rate: 120 Hz (144 Hz OC) | Response time: 4ms | Adaptive Sync: G-Sync | HDR: YES | Connectivity: HDMI, DP | Color support: AdobeRGB 99% | Speakers: No | Weight: 27.06 lbs. Acer just came up with shocking 4K resolution monitor to cheer up gaming enthusiasts. Predator X27 is the one of its kind, making the name as the earliest monitor to pack a whopping 144 Hz in its punch. Finally, that means gamers’ dream come true to push their gaming PCs’ capabilities to 144 fps. The response time is quicker too with 4ms rating. Surprisingly, Nvidia’s G-Sync adaptive technology chip intend to help you with premium HDR support and tearing free gaming process. Further we go in specifications and we find Quantum Dot technology per 10bit color with AdobeRGB color gamut. Thus, IPS matrix technology will take care to give eye friendly true color visuals. Consequently, it has very high price tag under $2k. However, it’s worth getting it for long term. 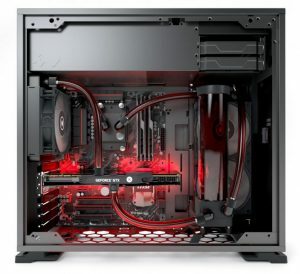 In a nutshell, your personal computer must have strong graphic card to run games above 60 fps and multicore processor to handle heavy logical processing tasks. We assure you these particular specs are future proof for next 5 years. So, is your PC specs ready for this incredible 4K monitor’s demands?! Screen: 27 inch | Aspect ratio: 16:9 | Resolution: 3840 x 2160 pixels| Panel Type: IPS | Refresh Rate: 60 Hz | Response time: 5ms | Adaptive Sync: Freesync | HDR: YES | Connectivity: HDMI, DP, USB type C | Color support: sRGB 99% | Speakers: Yes | Weight: 19.8 lbs. LG’s monitors tend to deliver gaming experience beyond the immersion into lifelike dreams. Here’s the long awaited true immersive gaming monitor LG 27UK850-W brings to the table advanced gaming features like split screen and borderless frame design might be converted into 8K resolution if you add 3 more similar monitors. Freesync second generation with HDR10 support provides zero stuttering and screen tearing. 5ms response time is attractive solution for fast paced games. HDMI HDR, Display Port HDR version 1.2 and USB Type C connectivity ports enhances your latest PC or console hardware with many options to stick them in. Adjustable display and on-screen control special features give you full control over the viewing angles and image settings. It also possess built-in speakers that triggers your budget not to buy external speakers. To sum up, under $700 price is very attractive for gamers and designers who appreciate their eye health with great IPS monitor. Screen: 27 inch | Aspect ratio: 16:9 | Resolution: 3840 x 2160 pixels| Panel Type: IPS | Refresh Rate: 120 Hz (144 Hz OC) | Response time: 4ms | Adaptive Sync: G-Sync | HDR: YES | Connectivity: USB, HDMI, DP | Color support: 97% (DCI-P3), 99% (Adobe RGB)| Speakers: No | Weight: 28.06 lbs. At last, Asus released definitive 4K gaming monitor to compete with Acer Predator series. Incredibly, PG27UQ model supports Asus Aura Sync RGB lighting on the bottom of its ergonomic stand. Surely, IPS matrix panel is right for your eye care. Default refresh rate is 120 Hz however overclocking feature can push your gaming refresh rate (FPS) further towards 144 Hz. Hence, screen is able to rotate vertically and adjust according to your preferred angle. Amazing Adobe RGB color gamut is edged to 99%, making it best immersive display for detailed game-world exploration. Nvidia’s Gsync adaptive sync technology is here to enhance stutter free and zero tearing experience. Response time is standard 4ms. So, the price is jaw dropping $2.5k but anyway it deserves this price point because 144 Hz 4K monitor makes you to save more in a long term due to future proof specs. Screen: 27 inch | Aspect ratio: 16:9 | Resolution: 3840 x 2160 pixels| Panel Type: IPS | Refresh Rate: 60 Hz | Response time: 5ms | Adaptive Sync: Freesync | HDR: NO | Connectivity: HDMI, DP | Color support: NTSC 72% | Speakers: No | Weight: 15.6 lbs. Not bad at all. Considering the standard specs and freesync AMD GPU support to enhance stable framerate with zero tearing. IPS is also main highlight in this case. Most important, you can save lots of money on this monitor. Decent 60 fps could be your dream on 4K with this lower price tag around $300. One more notable feature is on-screen control by LG, you may use this software to split the screen into 2 or 4 split screens. The color support is also reasonable when you focus only on gaming. We recommend this monitor for long sitting strategy games as your eyes would be comfortable with IPS display. Screen: 27 inch | Aspect ratio: 16:9 | Resolution: 3840 x 2160 pixels| Panel Type: IPS | Refresh Rate: 60 Hz | Response time: 5ms | Adaptive Sync: Freesync | HDR: YES | Connectivity: HDMI, DP | Color support: sRGB 100% | Speaker: No | Weight: 19.8 lbs. Phenomenal immersion into 4K gaming dream is achieved by LG 27UK650-W. With Six axis control joystick is very swift and friendly to adjust to any mode. HDR 10 support is enabled by AMD’s Freesync second generation. Although, response time is 5ms, here you have standard reaction time overall. Hence, 60 Hz refresh rate means 60 fps is guaranteed to heavy gaming guy with premium PC. IPS type of panel tends to deliver true image’s color and game character’s details. Frame body may tilt and also able to rotate for professional use. sRGB 100% color gamut will give you ultimate luminosity experience. This monitor is consistently on sale for sub $600 in North America. To finalize, LG came up with brilliant gaming monitor product for mass market in terms of price to performance which will make you to immense in colorful RPG and turn based strategy titles. Screen: 27 inch | Aspect ratio: 16:9 | Resolution: 3840 x 2160 pixels| Panel Type: IPS | Refresh Rate: 60 Hz | Response time: 2ms | Adaptive Sync: Freesync | HDR: NO | Connectivity: HDMI, DP, USB | Color support: sRGB 100% plus NTSC 75% hybrid | Speakers | Weight: 18.43lbs. Viewsonic is not behind others on every aspect. The latest ultimate ViewSonic XG2700 4K monitor product is boasting with premium features. Very ergonomic body frame design makes it as a heavy duty monitor for gamers and professionals. Similar to other monitors, refresh rate is standard 60 Hz that gives you 60 fps enhanced by PC hardware. Adaptive sync technology is linked to AMD’s Freesync team. 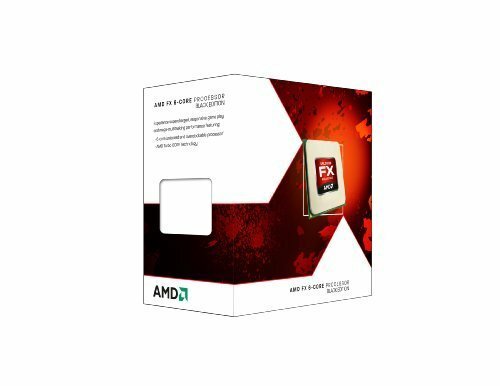 If you enjoy legendary FPS like Doom (Vulkan API) please get AMD Radeon RX Vega 64 Graphics Card this monitor will give you 60 fps with no tearing experience on high settings. sRGB 100% method of color support delivers colorful gaming process. Most highlighted feature here is 2ms fast response time that enables less latency for FPS titles. Well, tight budget 4K gamers would love this perfect monitor because it lands on sweet price point just under $600. Screen: 32 inch | Aspect ratio: 16:9 | Resolution: 3840 x 2160 pixels| Panel Type: VA | Refresh Rate: 60 Hz | Response time: 4ms | Adaptive Sync: Freesync | HDR: YES | Connectivity: HDMI, DP, USB | Color support: 95% DCI-P| Speakers: Yes | Weight: 21.5lbs. It’s too big but very true gaming and office purpose leader. 4K monitor Benq EW3270U comprises full Freesync HDR support with a standard 60 Hz refresh rate. VA (vertical alignment) panel type also provides true image quality. 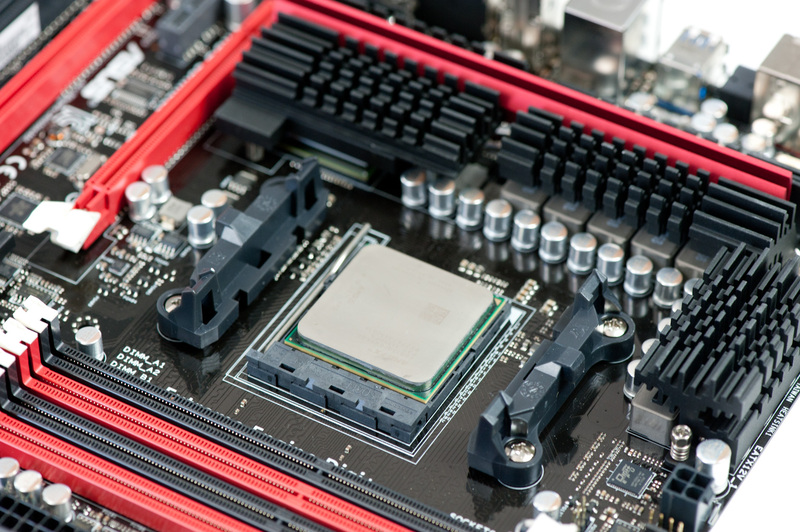 4ms response time would be more than enough for your fast gaming needs. Benq always have been associated with eye caring features so here same technology is provided in EW3270U model. It effectively filters blue light and reduces eye discomfort. Very interesting point is this monitor possess intelligent adjustment technology to control the brightness according to ambient light conditions and color temperature depending on real time screen content. Additionally, USB type C connectivity extends your laptop or MacBook using experience into color rich gaming or work related tasks. Here we go with competitive pricing on Benq EW3270U, easily sticks under $800 with higher quality and unique features that’s not bad at all. Screen: 27 inch | Aspect ratio: 16:9 | Resolution: 3840 x 2160 pixels| Panel Type: IPS | Refresh Rate: 60 Hz | Response time: 4ms | Adaptive Sync: G-Sync | HDR: NO | Connectivity: HDMI, DP, USB | Color support: 16.7 Million| Speakers: Yes | Weight: 14.9 lbs. Silky smooth 4K resolution images: The AOC AGON AG271UG packs a 27 inch 4K IPS panel capable of a 60 Hz refresh rate and a short 4 ms response time. The IPS technology allows wide viewing angles of up to 178 degrees. NVIDIA G-SYNC special chip lets gamers enjoy fast-paced visuals at 4K resolution without any stuttering, tearing, or input lag. With its 4K resolution of 3840 x 2160 pixels, this 27 inch display boasts an immense pixel density. Like all models from AOC’s premium gaming monitor line-up AGON, the AG271UG is equipped to improve gamers’ satisfaction. The AOC Ergo Dial Base lets users adjust tilt, swivel and height (height scale included) to maintain a healthy and comfortable posture. Users who spend long hours in front of a monitor will experience less eye-fatigue and eyestrain with AOC’s Flicker Free technology, while AOC’s Low Blue Light option reduces potentially harmful short wavelength blue light. Gamers who want the upper edge can use AOC Shadow Control which brightens overly dark areas and vice versa without affecting the rest of the screen. Pro gamers will also appreciate features such as very unique headset holder and a carrying handle for easy mobility. 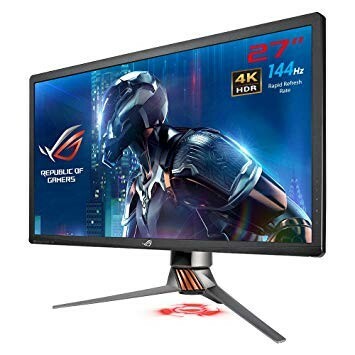 Screen: 32 inch | Aspect ratio: 16:9 | Resolution: 3840 x 2160 pixels| Panel Type: MVA | Refresh Rate: 60 Hz | Response time: 5ms | Adaptive Sync: Freesync | HDR: YES | Connectivity: HDMI, DP, USB | Color support: 8-bit+Hi-FRC| Speaker: Yes | Weight: 25.1 lbs. 4K gaming experience on PC or Console? Why not use both? Experience with the ViewSonic XG3220 4K Ultra HD gaming monitor, you get everything you need in a crossover display with faster-than-TV input response. Featuring 3840×2160 resolution, this 32 inch monitor provides amazingly sharp and detailed visuals, while HDR content support delivers a high dynamic range of vivid color and contrast for incredible screen performance. For Xbox console gamers something good coming at last AMD enables Xbox One X console to sync with Freesync monitors. Specifically, AMD FreeSync standardized monitor reduces image tears and choppiness for smooth gameplay. An exclusive ColorX gaming mode delivers optimum speed and visuals, while an arsenal of pre-set customizable visual modes keep you ready for any FPS, RTS, or MOBA gaming scenario. Furthermore, a customizable 22-level black stabilization function helps you target enemies lurking in the dark, while the monitor preserves luminously rich colors and contrast. With future-proof DisplayPort and HDMI 2.0 to support 4K UHD resolution at 60Hz, this monitor pushes the limit of gaming process potentially for console and ultra-gaming PC. Screen: 43 inch | Aspect ratio: 16:9 | Resolution: 3840 x 2160 pixels| Panel Type: MVA | Refresh Rate: 60 Hz (80 Hz OC) | Response time: 4ms | Adaptive Sync: Freesync | HDR: YES | Connectivity: HDMI, DP, USB type C | Color support: NTSC 119%, sRGB 145% Hybrid | Speakers: Yes | Weight: 25.1 lbs. Philips just threw themselves to the hot gaming monitor competition industry with 43 inch behemoth monitor. The following monitor Momentum 436M6VBPAB supports full 4K native resolution through Display Port with effective 60 Hz refresh rate, anyways if you tweak it to OC mode it may offer you 80 Hz. Response time is quicker too in short 4ms. Thanks to AMD’s latest generation Freesync HDR10 support for delivering smooth gameplay experience with zero tearing or stuttering. It packs with internal built-in speakers that can save your money on external ones. Most attractive feature of this incredible tech is Quantum Dot which is able to provide high contrast true color. MVA matrix panel type is installed on screen making it friendly to your eyes by filtering blue light. Hence, Ambiglow enhanced lighting extends colorful brightness in gaming process. For budget 4K gamers it could be bang for your buck because sub $1000 is perfect sweet price tag into future proof planning. The Word “Gaming” is seriously meant for gaming, our shortlisted choice is made by experienced gamers who appreciate the manufacturers’ intentions to push the boundaries in terms high performance, affordability and durability. Therefore, this dedicated article is incredible explanation on why “Gaming” term is highlighted by gamers as much as human needs water to live. Gamers, whereas First Person Shooter (FPS), Real Time Strategy or Role Playing Game players, easily know about what it takes to be effective winners in a hot competition. Today, our intention turns into broad market of Gaming Monitors. When you purchase quality monitor from respected company you always have high expectations in terms durability, reliability and future proof. Of course, monitors might be future proof compared to other components in your Gaming Personal Computer (PC). For instance, it only takes 3 years till your Graphics Processing Unit (GPU) becomes outdated or unreliable for fast gaming experience, besides that, your Central Processing Unit (CPU) might be slowing down within 5 years. However, Monitor can serve you well throughout your competitive gaming life with the expectancy of 5-7 years’ service if you made a right choice. 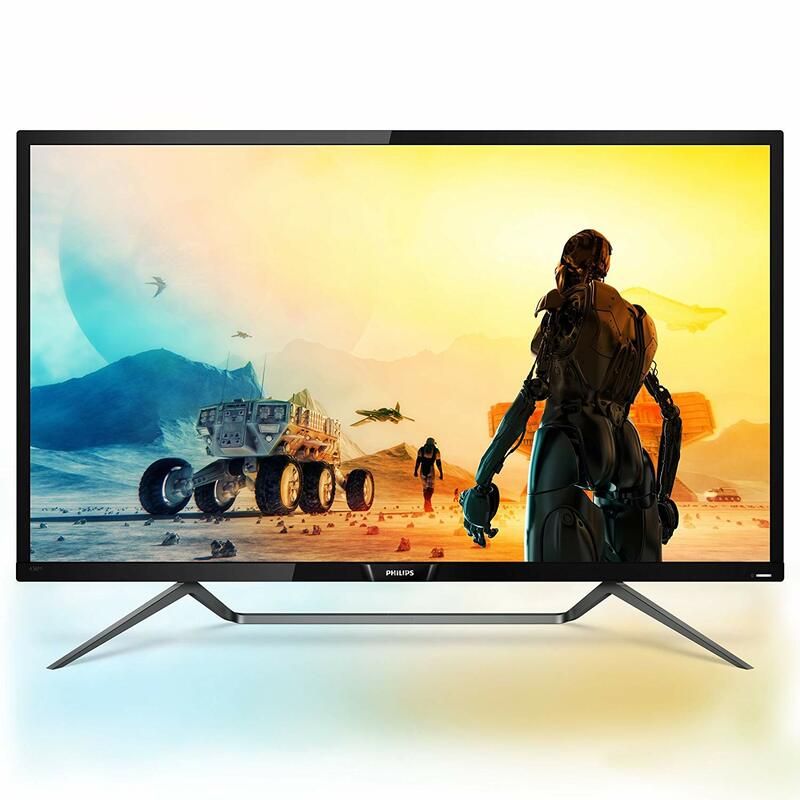 So our top 10 list choice is focused on terms such as resolution, matrix technology, size, response time, adaptive sync technology, refresh rate, color support, aspect ratio, brightness, viewing angle and weight. In-Plane Switching (IPS) mode panel provides true color experience while you focusing on graphics details, to be short, your eyes see every object’s details in exact colors even from sharp angles because the pixel’s matrix position builds images according to chevron shape, this is why 3D designers who develop characters need IPS monitors which can provide consistent colors in stable response time. Nowadays, IPS panel monitors are improving quickly in terms of refresh rate and bit expensive in price point but worth to invest. The eye friendly Vertical Alignment (VA) panels are cheaper and very useful to gaming needs with fast refresh rates (144hz) and response time (1-4ms), although it cannot offer you precise true color experience, anyway winning the game and toping the leaderboards are most important. Twisted Nematic (TN) is the old technology in monitor industry, easy to produce, much lower price tag however it has fastest refresh rate up to 240hz (240fps) and less latency compared to IPS, if you sit closer to it you might notice blue light excess therefore we do not recommend you to use it for longer time maybe 2 hours enough as TN panel long usage may harm your healthy eyes. Firstly, 24 inches screen is a standard preference for most gamers. Hence, 27 inches offers you detailed view from any angle and you might sit further to see whole picture while enjoying your drinks. Amazingly, 32 inches enhances broader view to your family members or friends who may support you while you gaming with hard to defeat boss character or PUBG (Player Unknown’s Battlegrounds) competition. The command given by user to the hardware and monitor reacts to it in a split second, which is the monitor response time. Obviously, 1ms is the fastest response time ever in the latest generation of monitors, FPS (first person shooter) gamers desire is likely to be less latency. If you play third person games like Shadow of Mordor or Final Fantasy, cheaper option 5ms is already meeting your demand. Between 1ms and 5ms will be not much different gaming experience because both are quick enough to deliver stable frame rates. Rejoice, this time around screen tearing and half screen freezing will go away forever. Gamer finds sometimes hard to select between AMD’s FreeSync and Nvidia’s G-Sync. 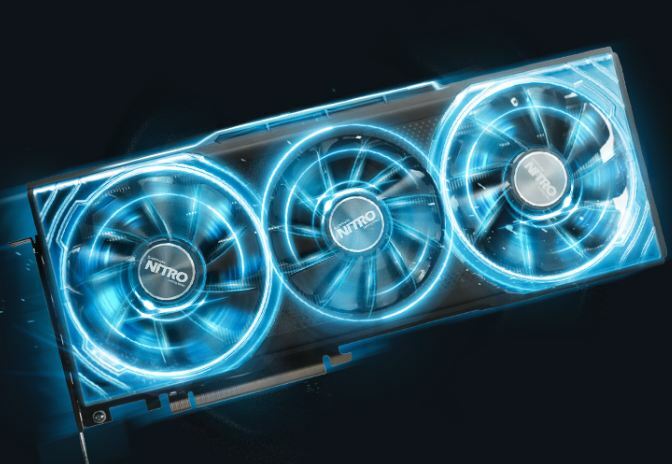 The choice is clear when you identify the GPU you playing with. Vertical Synchronization of particular frame per second is popular graphic’s setting, unfortunately, vertical sync provides dramatic drop in frame rates. Therefore, two giant companies launched their own technologies to solve this problem in gaming industry. AMD adopted Freesync technology which is majority monitor manufacturers’ massive production inception since 2014. Unlike G-sync, Freesync is way cheaper and supports all AMD GPUs latest lineup. However, G-sync is bit expensive and not compatible with all Nvidia’s GPUs but it comes with more precision and lesser latency support with HDR. Recently, Freesync 2 HDR support based monitors released in 2H 2018 resulting the hot competition to the table. This specification of monitor is the important feature where word Gaming defined. Massively adopted 60 Hz (Hertz) monitors are fading away from gamer’s shopping carts. The reason is that 60 Hz only can give you 60 fps (frame per second) output. Difference between 60 Hz and 144 Hz monitors is comparison of Heaven & Earth. It is simple, 144 Hz wins your heart and minds easily. For example, game like PUBG requires higher frame rate to produce quick reaction against your opponents. 120 Hz or 144 Hz is the way to go. Please note that every 4K monitor has to be connected via Display Port in order to achieve stable 60 fps. All in all, the GPU can push its full capacity when it’s connected to 144 Hz monitor as a result giving you 144 fps. What a great time to live now?! While Gamers mostly focus on gameplay process. Sometimes few of them prefer color depth of their monitor when it comes to choosing character customizations. Most variety of monitors come with sRGB (RED GREEN BLUE) color support, meaning that maximum number LCD panel’s color reproduction method. Typical current generation monitor produces 16.77 million colors in 8 bit matrix specs. Furthermore, 3D LUT (Look Up Table) monitors generate smooth three dimensional blending transition from color to color in 10 or 12 bit specs and gaining accurate brightness, chroma and hue. Generally speaking, 3D LUT monitors are specifically oriented for 3D developers and costume designers. As a consequence, sRGB monitor is a good choice for gamers. This term defines the Height and Width of a gaming monitor. 16:9 is the most popular wide screen monitor aspect ratio. All latest games well optimized for 16:9. Some old games might run only on 4:3 because of graphics settings limits. Hence, several 2018 monitors have 21:9 Ultra Wide aspect ratio obtained little bit popularity with less optimized games (especially old titles). Some software driver support for Ultra Wide monitors are very poor. All in all, we recommend 16:9 aspect ratio for peace of mind. Luckily, majority monitors produce true image despite the way gamer positioned to view. Older generation monitors could not satisfy you with dark blue or red violet color when you look from 45 or 75 degrees. Latest generation displays offer you immense true colors from any angle you view according to 178 degrees / 178 degrees standards. Last but not least, prominent monitor manufacturers able to push the limit of displaying technology by producing HDR (High Dynamic Range) monitors. Scientists simply define HDR as an adaptation of the image which gives high level of luminosity. For quick example, human eye able to achieve true luminosity while staring at the picture for 5 minutes. This process can be done by HDR supported monitors easily in a split second. Mobile phones also have HDR feature in their camera but the rendering process takes 2 seconds to complete. When it comes to a creative work such as video editing, 3D design, and music production and so on, there is a special mouse that is called a trackball. Trackball looks like a normal mouse and often shaped like that, but it features a special ball that is used to adjust many things in creative software. For those people we have prepared a list of few good trackball mice in a different budget from Amazon and Ebay. The Logitech’s M570 Wireless Trackball is a very popular and famous trackball mouse available in Amazon. It is an ergonomic mouse with great accuracy and good laser tracking. You can connect as much as six compatible devices at the same time by using Logitech Unifying receiver. Because it is a wireless mouse it does require a AA battery to run and there is one battery in the box when buying this mouse. One of the main strengths of this model is that it can go up to 18 months in a single battery. The mouse can go up to 30 feet from the device and that is the farthest it can go. It is compatible with both Windows and Mac OS.The pros of this trackball are that it is very ergonomically shaped, the battery life is great, great customization option yet simple to use mouse, strong wireless receiver and great performance at its price point. The disadvantages for this mouse is that this mouse is only for the right hand users as it is shaped to fit only right hand use. Other than that this trackball just might be the best option to replace your regular mouse. This mouse is also from Logitech and it costs much more than the previous one. However, there is a reason for that. This mouse uses much more advanced internal and better design. It is specially designed to fit any hand perfectly, and due to this design it can provide a comfortable working environment for hours of use. It comes with integrated battery with up to 4 months of use and it is rechargeable through USB cable. It also features an adjustable hinge for adjusting the angle of the mouse from 0 to 20 degrees. Other than that this moue has more precise and improves sensor and multi-device use function through Bluetooth. The software for this device even allows files to be transferred between computers. Strength of this mouse is that the battery is now not removable and rechargeable, the shape of this mouse is even more ergonomic and comfortable, the adjustment for the mouse angle makes it even more comfortable for long usage sessions and improved sensor over the M570 mouse. This mouse also have weaknesses and they are the price, which is almost four times over the price of M570 and this mouse is still for right hand users only. Despite all those weaknesses this one great mouse with great shape and most premium feel. This is an odd shaped mouse as it does not look like a normal mouse. It features a ball located on top instead of on the side. This makes scrolling easier and faster in applications. Furthermore, the shape of the mouse makes it comfortable for left hand users. Kensington is one of the companies that makes trackballs that are suitable for both right and left hand usage. This trackball mouse also features Scroll Ring for comfortable and precise scrolling. This Scroll Ring allows fast and easy scrolling of web pages, files and documents. It is also comes with 2 customizable button design andTrackballWorks software to customize the mouse functions. This mouse is compatible with a variety of operating systems such as Windows and Mac OS. This mouse uses optical sensor which is precise and accurate for almost any type of use. This mouse uses USB connection to connect to the computer and it is a wired mouse. The advantages of this mouse are the ambiguous design for left or right hand use, small size to preserve the desk space, Scroll Ring for click-free scrolling and the price that is the cheapest in our list. The disadvantage of this mouse is that uses USB cable and it is not wireless. This is the best mouse for left handed users at a budget. For this mouse Kensington decided to use the similar design as its older mice. However, the company has changed the quality and performance of the mice to be better. The Expert Wireless mouse is versatile, ergonomical, with amazing features and performance. It has ergonomical design with a detachable wrist rest, which is very soft and comfortable for hours of use. Just like their other trackball, Expert mouse is suitable for both right and left hand usage. This mouse has four buttons with different functions. Company’sTrackball Works software lets you customize all 4 buttons and adjust cursor speed. The mouse uses Diamond Eye optical tracking technology and together with a large ball they provide exceptional accuracy and precision. Their Scroll Ring returns with this mouse also. Now it is improved to provide easy scrolling. The mouse is connected via Bluetooth 4.0. The mouse is powered with one AA sized battery and it lasts long due to the special sleep function that preserves energy. Mouse is compatible with almost any operating system, whether it is Windows, Mac, Linux, Chrome OS and so on. The strengths of this mouse are the design for long comfortable use and left hand usability, simple yet powerful, easy to customize, and precise and accurate sensor. The weaknesses are larger design and much more expensive price tag. This mouse is specifically designed with 3D designers in mind. This is not a cheap mouse and it’s been around for quite some time. Due to its unique design and functionality it has received many positive feedback. This mouse is carefully designed to make sure that it is functional and comfortable. It can be used by left or right hands. This mouse is just simply the best trackball mouse for the 3D designing, as it allows you to control all the functions available in 3D software much simpler and easier. It is an ideal product for 3D designers, engineers and architects. It uses advanced 6 degrees-of-freedom optical sensor unique to this product. It allows simultaneous pan, zoom, rotate and other functions for the 3D software. This unique combination of a sensor and the technology allows you even more precise movements that were not available from other mice. It also features 2 programmable function keys that user can customize based on the needs. This is a very high quality product with great functionality that allows you easy usage and high accuracy in 3D designing. However, this product is not all perfect, as it is meant specifically for 3D software only, which makes it hard to use for other application. Furthermore, the rice is too high for a product that is made for a single type of usage only. ELECOM is another company that is manufacturing trackball mice. The company makes both wired and wireless version of this mouse and if you don’t mind cables and want to save money, you can grab wired one few dollars cheaper. This is a well-designed product, with ball located on top of the mouse. This mouse only support right hand usage as it shaped for right hand usage only. For around 50 dollars, this is a nice trackball mouse. It features highly programmable 8 buttons. ELECOM is the only company that makes trackball mice with many buttons. The mouse is built with good quality products, it feels good at hand and feels durable. The ball is precise and accurate. It is located on the top of the mouse and allows index finger use, instead of thumb used by other mice. The ball can be easily removed and cleaned. This mouse comes at a size of normal mouse, which makes it easier to use, however, for those with larger hands it might be small and uncomfortable. The strengths of this mouse is that it comes in both wired and wireless version, the unique ball design for index finger use, the price is budget friendly, it features 8 programmable buttons and the build quality is great. The weaknesses of this mouse are that it can only be used by people with small hands and it is designed for right hand only. 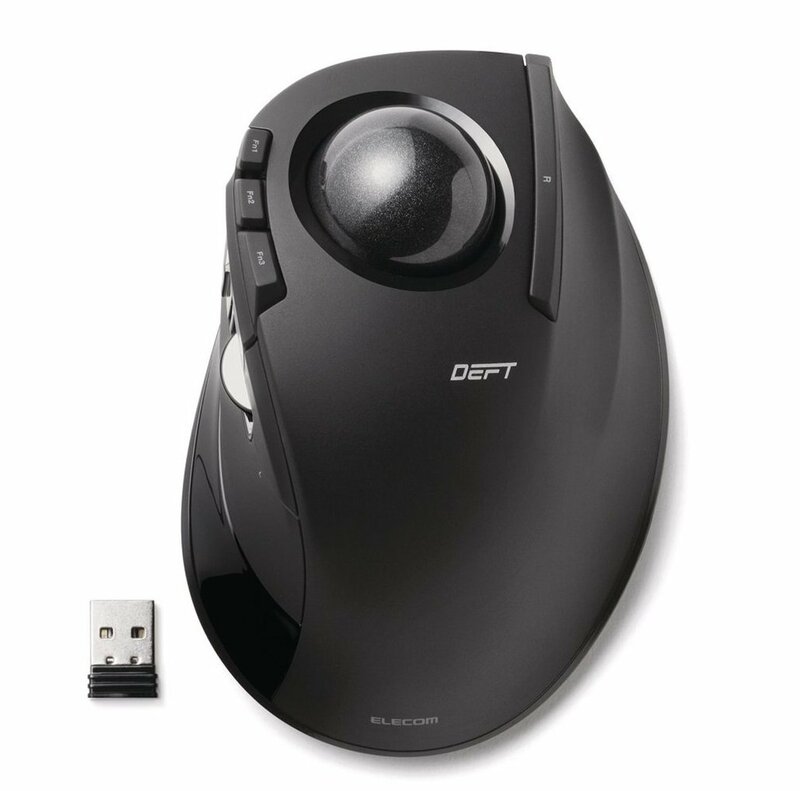 This is a budget oriented ELECOM trackball mouse as it comes at very cheap price point. This mouse looks and feels just like Logitech M570, with comfortable design and great build quality. Just like other ELECOM mouse this one comes with wired and wireless versions. It uses advanced optical sensor which provides smooth and accurate tracking experience. This mouse is designed for right handed use with ball located on the left side for thumb usage only. The left side is ergonomically shaped for better comfort. It features Back/Forward quick navigation buttons on the top left side and one function button for pointer-finger. The buttons made by OMRON, which makes very high grade switches and buttons for keyboards and mice. The resolution can be changed and it features two sensitivity levels of 750 and 1500. The ball is removable and can be easily cleaned. Lastly, this mouse features a scroll wheel for better navigation. The strengths of this mouse are the great build quality for its price, great quality buttons, several programmable buttons, comfortable grip and good sensor with sensitivity adjustments. The weaknesses of this mouse are that this mouse is meant for right hand use and that it does not provide anything over its competitors. This mouse is ELECOM’s top of the range premium mouse. It also comes in wired and wireless versions. This is a very good mouse, with good built quality and great functionality. Unlike many other premium mice, this one features trackball on the top for index finger use. This mouse uses improved sensor with high level of accuracy and sensitivity, which provides good responsiveness and precise movements. This mouse is also larger than the company’s other mice, which makes it much more comfortable for the people with large hands. This mouse is still for right handed use only as it is designed for right hand grip only. This mouse also features several buttons, eight to be precise. They are highly customizable and programmable, which makes it easy to record many macros or shortcuts on those buttons. This mouse features three level DPI adjustments, 500, 1000 and 1500 DPI. Lastly, it features tilt wheel for further enhance the comfort level. To sum up, the strengths of this mouse are that it is much cheaper than the competition, it uses precise sensor, features many buttons and comfortable for long sessions. Weakness of this mice is that it is shaped for right hand use only. This is a last mouse in our list. This is a unique product as it is shaped just like a game controller. 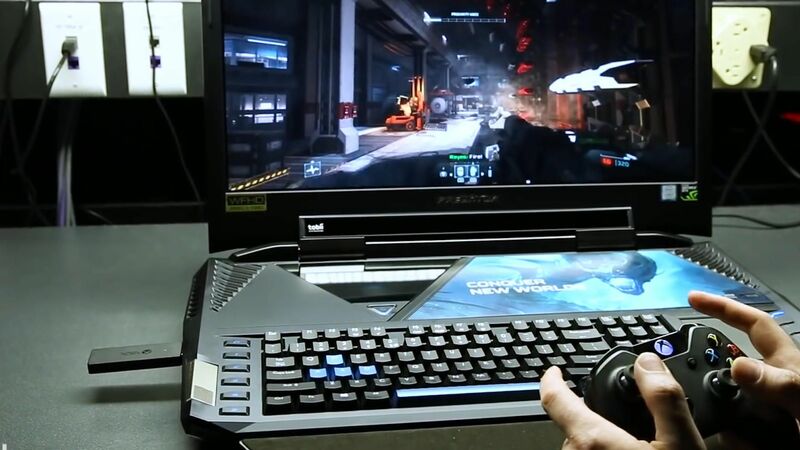 I am not sure if it is possible to play games using a trackball. However, this wireless mouse is great for those who are using the trackball to present their work and need to do it far from the computer or present while standing. Due to its design it does not require a table to use it. It uses wireless receiver to connect to computers and can go as far as 10 meters from the pc. It uses USB interface and works with almost any operating system. The sensor features four levels of DPI: 400, 600, 800 and 1200. The strengths of this mouse is the unique design suitable for standing usage, great quality for the price, can be used by right and left hands and 10 meters distance for the receiver. Weakness of this mouse is that it is oddly shaped and might not be as functional as other mice in this list. There are many great trackball mice available on Amazon and Ebay. For those who are looking for best budget options, then Logitech M570, ELECOM M-XT3URBK Mouse or Kensington Orbit will be a great choice, with Orbit being only ambiguous mouse suitable for left and right hand use. For premium mouse Logitech MX ERGO and ELECOM Wireless Trackball Mouse are way to go. For left handed user best premium product is Kensington Expert mouse. SpaceNavigator is the best mouse for the 3D designing. Y-10W is a unique mouse suitable for using as a presenter. Gaming mice have reduced in prices a lot in the recent years. There are many new gaming mice at an affordable prices and with good quality. Gaming mouse plays an important role in any gaming setup. Only the best MMO mouse can provide comfortable gaming experience. Many gaming mice cost just a bit more than a normal mouse, yet they provide better sensitivity. Some people might get adjusted to the keyboards over a period of time. However for those who are looking for good quality MMO mice, here is a list of few best MMO mouse available on e-retailers. TeckNet HYPERTRAK Gaming Mouse is a cheapest mouse in this list. Despite being the chepest it features a 16400 dpi laser sensor with 50g acceleration force. The DPI is adjustable and it has 4 levels of adjustments. This sensor is pretty capable and sensitive enough for any user. Just like many other MMO mouse, this one features many buttons, 10 to be precise and they are programmable. It features five user profiles that are fully customizable. This will allow five profiles for five different games. This mouse also features a customizable lighting with several colors to choose from. It also features a weight system that allows adding or removing weights to adjust the weight that is ideal for the user. This mouse is a claw grip design, which is good for fast response. However, it is a medium size mouse and if a person has big hands, it will be uncomfortable. This mouse comes with braided USB cable with gold-plated USB connector for long lasting and reliable connection. This works supports Windows 98/ME/2000/XP/VISTA/Windows7/WIN 10. This HAVIT mouse is a great MMO mouse for the beginners. It costs more than the previous mouse. However it has more functions and buttons to compensate for that. This mouse comes with Pixart PMW 3360 optical sensor with up to 12000 DPI which is adjustable (500/1000 (default)/1500/ 2000/4000/8000/12000 DPI). This mouse also features 250/500/1000 Hz adjustable polling rate and 50G acceleration. This mouse comes with a software so all the settings can be set up there and it is possible to create some profiles that suit your gaming style and needs. One of the main strengths of this mouse is 19 fully programmable buttons which can be customized through software. These buttons are enough for nay MMO game, or they can also be used for macros for those who use this mouse for productivity work. This mouse also follows RGB trend with 16 million customizable lighting with several lighting modes. This is a right handed mouse with medium size and suitable for both claw and palm grips. The rubber texture keeps the hands from slipping. The mouse comes with 1.8 m braided cable with gold-plated USB connector, which is a long lasting very high quality one. This mouse supports all the versions of Windows and even Mac OS. Redragon M901 PERDITION is a wired gaming mouse that costs just slightly more than HAVIT. This company has become famous for high quality mechanical keyboards at an affordable prices. This mouse just like their other products is a value oriented product. It features 16400 DPI sensor with five adjustable DPI levels (1000/2000/4000/8200/16400), up to 1000 Hz polling rate and 30G acceleration force. This mouse uses high precision Avago sensor with Omron micro switches. They are high quality and long lasting components. This mouse features five customizable profiles for different gaming styles. This mouse also features 8 pieces of weights for more customization options to suit the needs of the user. Not to mention the RGB lighting with many lighting effects, that can be adjusted and customized through a software. The mouse features 18 programmable buttons that is enough for any type of a game or any software macros. 12 of those buttons are located on the side and can be pressed by your thumb while the rest are located on the top of the mouse. This mouse is shaped ergonomically to perfectly fit most of the hands. A user can spend hours using this mouse without feeling any discomfort or pain on his hands. Other than that, this mouse features high quality Teflon feet for long lasting and smooth gliding, 1.8m thick braided cable with gold plated USB connector. This mouse supports any version of Windows available on the market, as well as some versions of Mac OS. This is another budget wired gaming mouse. Just like other ones it features similar specs. It comes with adjustable 16400 DPI Avago sensor, 1000 Hz polling rate and 30G acceleration. Buttons use Omron micro switches which are high quality and long lasting. This mouse also features 18 programmable buttons that can be programmed as user wants. There are five memory profiles that can be saved inside the mouse memory. There is also a lighting with 16 million colors that can be customized any way you like or disabled if you do not need it. Furthermore, this mouse features adjustable weights for better comfort and customization. In terms of functions, this mouse is very similar to Redragon mouse. This also comes with Teflon feet for smooth gliding and long lasting feet. It has ergonomic right handed design and it is a medium sized mouse suitable for those who have medium to small hands. Rubber material on the side of this mouse ensures better grip during intense gaming sessions. The cable is a 1.8m thick braided cable with a gold plated USB connector, just like many of its other competitors. Lastly, this mouse features 18 months warranty, which is a big plus. This is a very high quality wireless gaming mouse from Logitech. It is in fact cheapest wireless gaming mouse from a well-known manufacturer. It costs just slightly more than previous mice on this list. It features high-accuracy Delta Zero sensor with up to 2500 DPI. The DPI is adjustable. The sensor and a wireless receiver provide lag free gaming experience. Of course, this mouse does not feature any RGB lighting or fancy sensor, but at its price it gets the job done. This is Logitech’s older mouse designs. It is very popular among those who want a wireless gaming mouse but do not want to spend a lot for money for the expensive ones. One of the main strengths of this mouse is the battery life. It uses two AA batteries to operate and features Performance and Endurance modes to maximize battery life. Power-saving endurance mood guarantees up to 250 hours of battery life. This mouse features 11 programmable buttons. They are very high quality and can withstand up to 20 million clicks. The mouse supports Windows 10, Windows 8, Windows 7, Windows Vista, and Mac OS X 10.6.8 or higher. It has a software that allows customizations. This is a large mouse and it is very comfortable for nay grips. It is a right handed mouse though. This is one of the best high quality budget wireless mouse available on the market. This is slightly upgraded version of the previous Logitech mouse. This one is a wired gaming mouse with 20 programmable buttons. 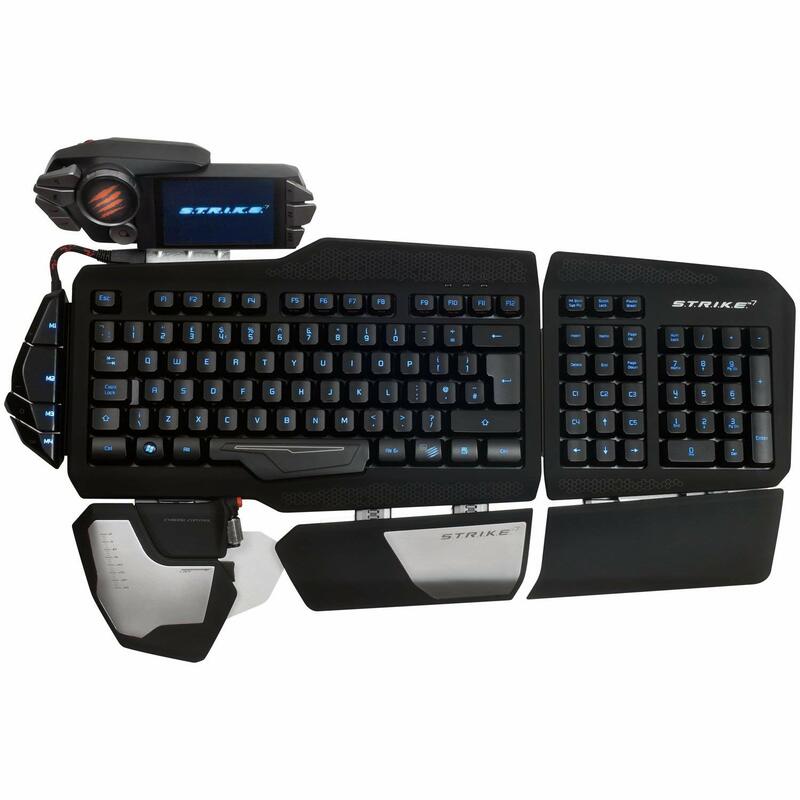 It includes 12 programmable buttons on thumb panel that are specifically designed for MMO gamers. They allow quick and easy navigation as their shape allows the thumb easily navigate without looking at the mouse. It uses Logitech’s own sensor with up to 8200 DPI sensitivity with adjustability from 200 all the way to 8200 DPI. Furthermore, it features G-shift ring-finger button. This allows adding more functions and almost doubling the amount of actions that can be assigned to each button. Buttons rated up to 20 million click. This mouse is also very comfortable mouse that fits perfectly into many hands, but it is a right hand shape only mouse. It allows personalization with the included software. The side buttons have lighting that can be adjusted to any color you want. This mouse is compatible with the latest versions of Windows. Razer is known for making one of the best gaming peripherals. This is their latest MMO mouse. One of the main strengths of this model is their most precise gaming sensor with 16,000 DPI. The DPI is adjustable and have several DPI levels already preset so it can be used even without a software. Another of their strengths are the 19 fully programmable buttons, from which 12 are located on the side. 12 side buttons have mechanical feel to them, so the users can enjoy tactile feel of a mechanical switch on this mouse just like in the mechanical gaming keyboard. This mouse features all the buttons any MMO player will need and they are enough for many macros and shortcuts. This mouse also features Chroma RGB lighting with 16.7 million colors to choose from. Razer software is really great and it allows any kind of customization. Whether it is setting up gaming profiles, customizing colors or whatever customization that the user wants can be done through their software. Many reviewers have stated that their software is simple the most simple and most functional out there on the market. This is slightly large mouse and it fits with any kind of hands. The shape is for right handed users and it is very ergonomic and comfortable. SteelSeries is also very famous for their gaming peripherals. This mouse is their MMO themed ones. This mouse is unique with their fastest and most ergonomic button layout available. They are built around your thumb so that they can be easily pressed with simple movement of the thumb. There are 15 fully customizable buttons of this mouse. Furthermore, left and right click buttons are one of the sturdiest ones with rated 30 million clicks. SteelSeries features what they call a tactile alert which alert the player about in game events. This mouse features 16,000 CPI custom PixArt sensor. It is very precise and accurate. This mouse is shaped as their most famous Rival 300/310 mouse. This shape is for right hand only, but it is so comfortable and many people consider it to be one of the perfect sizes. This allows palm, claw and fingertip grip styles. Corsair is also in the game for MMO gaming mouse with their Scimitar Pro RGB MMO gaming mouse. At first it seems just like any other gaming mouse. However, they focus on their exclusive key slider macro button control system. 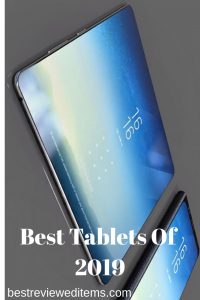 This is their unique design feature that puts all the side buttons in a closer range at the same time keeping button size big and comfortable enough to press. With this design this mouse features 12 optimized mechanical side buttons and they are real mechanical switches. Mechanical switches feature better actuation force and tactile feedback just like using a mechanical keyboards. This mouse is indeed designed for pro players no want to get the most comfortable design with design suitable for fast actions. The mouse sides and the buttons are textures for better feel and grip during the gaming. All the side buttons are customizable and can be used for any gaming or productivity software. Their software can easily customize this mouse. The software can safe three profiles on the mouse internal memory so that when you change to another PC you do not have to install. When it comes to sensor this mouse features custom gaming 16000 DPI optical sensor, which adjustments, high accuracy and fast tracking. This mouse even allows tuning for each type of surface so that mouse can be responsive and accurate regardless of the surface. This mouse is one of the most customizable ones. It is most expensive on this list. It also features the most customization for its side buttons. At first it looks like an average MMO gaming mouse. But when you look at the package you will notice that there are many accessories for the ultimate customization. First of all it features Modular Thumb Zone. All the buttons can be removed or their shape can be changed. There are also many designs available on their website that can be printed using 3D printer and then used with this mouse. This mouse features 18 buttons and all those buttons are customizable. Furthermore, tis mouse features an Easy-Shift technology, so that user can assign additional functions to this buttons. Secondly, this mouse features hotswappable Side Grips. Those side grips can accommodate different hand sizes and grip styles. If they are not enough, it is also possible to print more designs using 3D printer. User can even create buttons and side grips himself and then print them. As for the sensor it comes with 2000 DPI Twin-Tech Laser Sensor. This sensor is very precise and works well at any surface. Lastly, this mouse also features a software that allows any customization that user desires. There have been many developments in the gaming mice industry. Not just gaming mice have become more affordable. However, there have been many different kinds of mice developed for the special niche markets. Usually gaming were associated with first person shooter games. However, many other games have become popular recently. Many games have become online. Those games grew in popularity, because it is more fun to play with real people than with computer bots. For those types of online games some new mice were needed. For fast pacing online FPS games like Counter Strike or Player Unknown’s Battlegrounds, very sensitive mice were developed. They even called those mice Counter Strike edition and so on. Besides just FPS games, online role playing games and other MMO have become very popular. Let’s just take Dota 2. Millions of people playing it. There are many other very popular games just like those. For the sake of those MMO players, many gaming mice developers have created MMO mice. One of the main difference between normal and MMO mouse is that it has several programmable buttons on the side. MMO games usually need several buttons to bind some spells or skills and then they can be launched by pressing that button. Mostly people use a keyboard like that. However, when using a mouse for those buttons it is easier and faster to launch those kills. Furthermore, it is easy to remember the location of the button on the mouse rather than in keyboard. When the keyboard is not illuminated, it is easy to press the wrong button. This will ruin pleasant gaming experience. Mouse have become cheaper and better. Now we can enjoy many different types of mice for a different games. In this list we feature some of the best MMO mice available on Amazon. They come in different price points and with different features. If user wants something value oriented then TeckNet HYPERTRAK, HAVIT HV-MS735, Redragon M901 PERDITION or UtechSmart Venus will be a great choice. For best budget wireless gaming mouse Logitech G602 is the best as it is wireless and lasts long. However, it’s the sensor is slightly weak. Razer Naga Chroma is all-rounder in this list as it costs below $50 and has all the features and functions that the gamer will need. If you are looking for the best pro mouse then Corsair Scimitar Pro RGB MMO is the best. However, if you want the most customization then, ROCCAT Nyth is the only choice with its modular side buttons and grips. 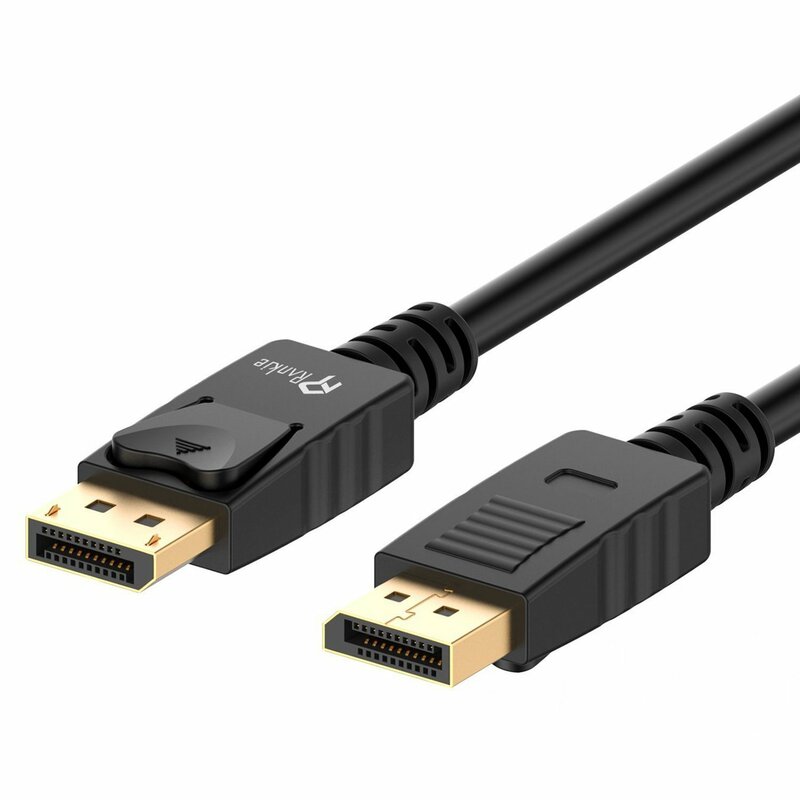 Displayport (DP) cable is one of the digital connection cables used by many electronic devices. Even though HDMI cables are more popular and available in many devices, displayport cables have several advantages over HDMI cables. Most of high speed gaming monitors and high resolution monitors use DP cables instead of HDMI, because latter cannot provide the bandwidth required by suchpanels. Monitors that support adaptive sync technology like G-Sync or Freesync both require DP cables and many high end graphics cards come with several DP ports. There is a wide variety of DP cables available on Amazon and Ebay. Here is a list of some of those cables that come at a budget price and have hundreds of positive reviews. This is a 6 feet DP to DP cable made by Cable Matters. It can be used to connect computer with monitor or projector and to extend one monitor to another one. It is made with gold-plated connectors, bare copper conductors, and foil & braid shielding. Together they provide both superior cable performance and reliable connectivity. Connectors are with latches with a release button, which provides a secure connection with easy unplugging. This cable supports video resolutions up to 4K and 1080p with high refresh rate and provides audio pass-thru for uncompressed digital 7.1, 5.1 or 2 channel sound. This is a good quality cable for gaming and content creation. This is another great cable from Cable Matters. It is just like the one above, but this cable is from Mini DP to DP cable. 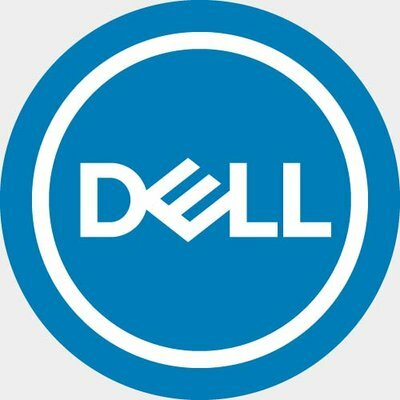 There are many graphics cards and laptops that have Mini DP connection only. This is usually happens due to the limited space available for that connection. This cable removes the need for buying an adapter to normal size. Furthermore, this cable is Thunderbolt compatible which make it compatible with a wide range of Apple products. Other than that this is similar to normal DP cable from Cable matters. It is made from same materials with braid and foil shielding, gold connectors and copper conductors. It also has a latch and a release button for easy connection and unplugging. This is a normal DP to DP 6 feet cable manufactured by Rankie. It has hundreds of positive reviews on Amazon and a 4.5 star rating. It is made with gold-plated connectors, copper conductors, and foil & braid shielding. This is a good quality DP cable that provides superior cable performance and reliable connectivity. Connectors are made with latches for secure connection and ease of unplugging. This cable support resolution up to 4k. However, this cable does not support high refresh rate such as 144Hz and works with 60Hz only. Main strength of this model is that it is cheapest 6 feet model with gold-plating. This is a great cable for watching movies and content creation as it requires only 60Hz. For its price this model is one of the best value for money. This one is 6.6 DP to DP cable by Accell. This cable has got close to 500 reviews with 4.5 star rating. Overall, this is a good quality cable. It supports resolutions up to 3840×2160 and 3D video. It can be used for PC or HDTV. The cable is DisplayPort 1.2 compliant with up to 21.6Gbps transfer rate. It also has a latch for securely attaching it to a monitor or TV. This cable is made from premium quality materials, such as high purity copper conductors and high-density triple metal shielding. Together they deliver superb performance. UltraFlex cable protection provides extra protection and reliability to this cable. The main advantage of this model is that it comes with a lifetime warranty. This means that the company is sure that this cable will last very long, and if will break the company will replace it with new one. This is the reason why this cable is much more expensive than other cables. Furthermore, this cable comes with a variety of sizes varying from 3.3 feet to 10 feet. You may see many DP cables that are available on Amazon or Ebay and choosing the right one can be a bit complicated, because too many to choose from. Our list summarizes some of the great ones that have 4.5 star rating and above as well as several hundreds of customer reviews. To matter which one to choose, they are all great cables, some of them even can work as an adapter whole others provide better performance.